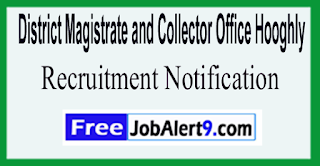 District Magistrate and Collector Office Hooghly Has Released Recruitment Notification For 20 Accountant, Counsellor Posts. All Eligible And Interested Candidates Can Apply Offline .Further Detailed Information Regarding Educational Qualifications, Age Limit, Selection Procedure, Exam Pattern, Syllabus for District Magistrate and Collector Office Hooghly Recruitment 2017 - 20 Accountant, Counsellor Post is mentioned below. Age Limit - Candidates age should be between 24 to 40 -Years (Post 1), 21 to 40 -Years (Post 2-5), 18 to 40 -Years (Post 6,7). Pay Scale - Rs. 17,500/- (Post 1,2), Rs. 11,000/- (Post 3), Rs. 9,000/- (Post 4), Rs. 14,000/- (Post 5), Rs. 7,500/- (Post 6), Rs. 6,000/- (Post 7) . How To Apply - All Eligible and Interested candidates Can Download application Form through official web-site (http://www.hooghly.gov.in). After Filling The application form, candidate must send hard copy of application a long with relevant testimonials (Mentioned In Detailed Advertisement) to the following Address before / (12th June 2017). Address -Social Welfare Section, Office of the District Magistrate Chinsurah, Hooghly . Closing Date of Offline Submission of Applications Is - 12-06-2017. 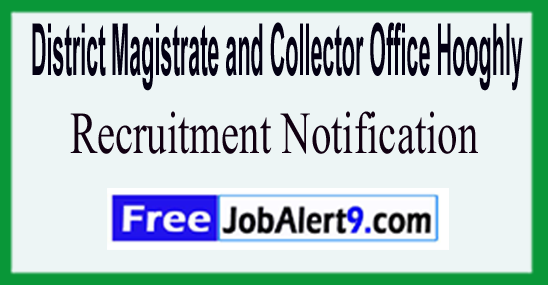 Click Here For District Magistrate and Collector Office Hooghly Recruitment 2017 Detailed Advertisement.